What is a New Home Construction Loan? Whether you’re renovating or building from the ground up, a home construction loan can turn your project from a daydream to a reality. A new home construction loan is a loan, in the form of a mortgage, that is used for the construction or renovation of a home. Although this kind of financing can be a great help to a new homeowner, it’s worth mentioning that construction loans sometimes have higher interest rates and tougher restrictions than conventional home loans because there is less collateral for the lender to collect if the loan goes into default. This is especially true when a loan is being used to construct a completely new home. If you already own the land the home is going to be being built on it’s possible to use it as collateral to get a better rate. These construction loans are typically built into a mortgage used to buy a property as a construction-to-permanent loan (also called a single close construction loan). Alternatively, they can exist on their own as construction-onlyloans (also called two-close construction loans). Construction-only loans tend to be short-term (usually around one year) and are mostly used for borrowers who want to start construction while they shop around for the best permanent loan. Construction-to-permanent have an expected timeline in place for the construction of the home, but they transition into a more standard long-term mortgage after the home is completed. They are also the most common type of loan. Most construction loans don't give the full sum up front, typically paying the borrower in installments as each phase of construction is completed. Construction loans can also be insured or uninsured, with the insurance, and insurance provider, playing a role in the the interest rate on the loan. When a loan is insured, the insurance agency provider agrees to pay for a percentage of what's owed if the borrower defaults on the loan. This insurance significantly lowers the risk, which means more favorable terms for the borrower. The three insurance types you typically see are as follows: VA construction loans are insured by the Department of Veteran Affairs (VA). FHA construction loans are insured by the Federal Housing Administration (FHA). Loans which are not insured by the government are called conventional loans. Rates for home construction loans vary between different types of loans and different circumstances, but they are almost always higher than they are for standard mortgages, mostly because construction costs are unpredictable, and (more importantly) a home that is under construction does is not valuable as collateral. If you own the land the home is being built on before taking out the loan or if you have other assets to use as collateral, that can help mitigate the risk for the lender and bring your rate down. Finally, fees for construction loans are higher than they are for standard mortgages since homes under construction need to be assessed at every stage of the construction. 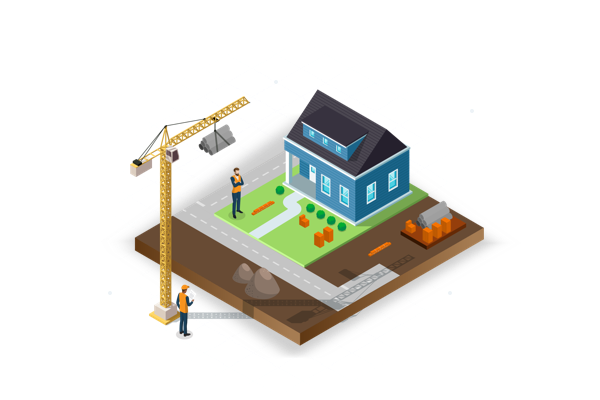 VA Construction Loans and FHA Construction Loans both have lower rates than Conventional Construction Loans because the government is backing the loans, making them lower-risk to lenders. However, even government-backed constructions loans have higher APRs than most traditional mortgages, due to the extensive fees associated with the assessment process. Construction-only loans usually have variable rates (a rate which changes in step with the prime rate of the lender) that typically ranges from prime +2 to prime +5. Construction-to-permanent loans usually have a variable rate similar to construction-only loans, but only for the construction phase, the loan converting to a traditional mortgage with a lower fixed rate (usually a 30-year term) after the home is completed. Due to the unpredictability of construction, and because an incomplete home does not make good collateral, home construction loans are a higher risk for lenders. As a result of this, the credit requirements for home construction loans are higher than they are for traditional mortgages. Lenders each set their own credit requirements, however, there are very few lenders who would consider giving a home construction loan to someone with a credit rating lower than 680. Additionally, lenders will likely investigate the credit histories of your contractors. The standard down payment for a conventional construction loan is 20%. Some lenders will be more lenient for credit ratings if the borrower is willing to make a larger down payment. If your home needs significant repairs to be liveable, you can get financing either through a bank or the FHA's 203(k) program. With the FHA, the government backs the loan, ensuring that the lender gets paid even if the borrower defaults on the loan, which means lower rates. These loans are designed for and limited to for homeowners and non-profit organizations only, and cannot be used by investors to flip properties. are likely your best option since they have lower down payments than conventional construction loans. Modular homes are built in separate sections, in a warehouse and then combined on location. They are a popular choice for buyers looking for a customized new home, as they are an average of 20% cheaper than homes constructed on site. Getting a home construction loan for a modular home works in much the same way as it does for any other home, although there are sometimes extra fees for assessing each section separately. A manufactured home is similar to a modular home, but they are built with a steel frame as opposed to a wooden one. The sections of a manufactured home tend to be like blocks, for easier transport. Financing a manufactured home is very similar to a modular home or a home constructed on-site. It’s worth noting, though, that some communities have building codes against manufactured homes. Check sure that your site does not have any restrictions against manufactured homes before committing to construction. Home construction loans are often the only way to get funding to build a customized home. While construction loans are more costly and harder to get than standard mortgages if they are handled properly than can be more than worthwhile.